A distinctive characteristic of quantum theory is that a pure quantum state precisely characterizes the values of only half of the physical magnitudes of the system it describes: Canonically conjugate magnitudes are not jointly precisely specifiable as they are in classical mechanics. Classically, the space of particle joint position–momentum states, phase space, is a six-dimensional manifold of points; in quantum mechanics, states can be associated only with finite areas, for which the product of the variances of these quantities are less than half the quantum of action \(\hbar\), in an analogous space. In the case of a fundamental system such as an electron, position or momentum may be precisely specified, but the precision of their joint specification is inherently limited, as expressed in the Heisenberg–Robertson uncertainty relation, which follows from the quantum superposition principle. 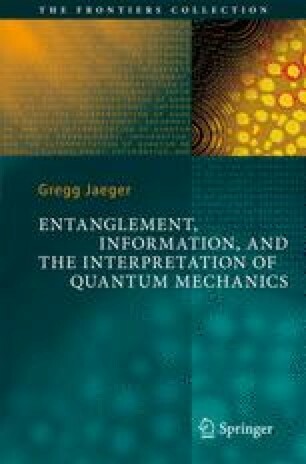 Because the physical properties of signals constrain communication, the uncertainties of states used for signaling and correlations between transmitter and receiver being of paramount significance, quantum mechanics also endows quantum information with a character distinct from that of classical information.